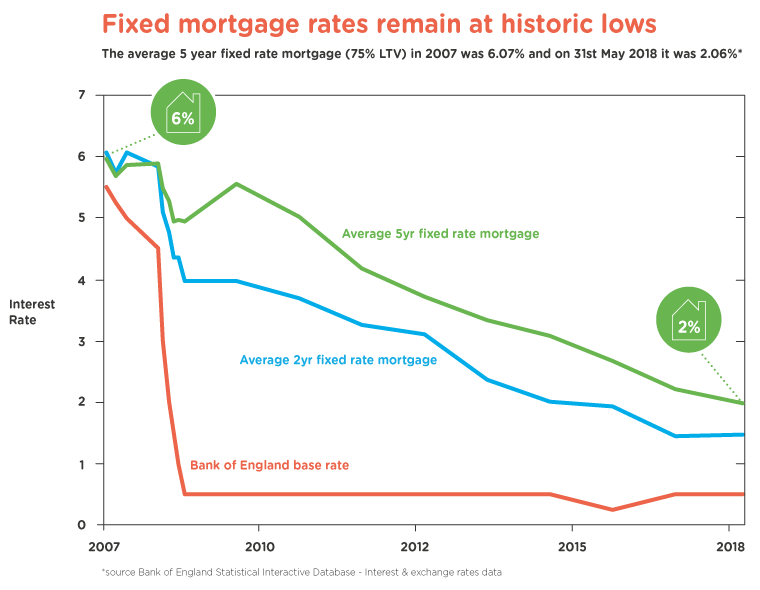 As the chart shows, fixed mortgage rates remain at historic lows, with five-year rates available below 2% in May 2018. You don’t have to fix your rate for five years though to benefit from a low rate. Deals usually range from two years up to 10 years or longer, so you can pick a term to suit your needs. Many people on their lender’s standard variable rate choose to fix their mortgage rate, so they have peace of mind that their rate won’t change for a set period of time. Many first time buyers choose to fix their mortgage rate, so they have peace of mind that their rate won’t change for a set period of time. If rates drop, you will be tied in to your chosen rate for a period of time typically 2, 3 or 5 years and your payments won’t go down. Even if the base rate goes up your monthly payments will remain the same. If you’re currently on a standard variable rate with your existing mortgage, you could find your payments are lower (this depends on your current interest rate, your new rate and the amount of borrowing). Many lenders still offer you the ability to make a certain amount of overpayments without penalty during the initial term, which could reduce your term and the interest you are charged. If you are in a fixed deal already, you may be able to keep the low rate and take it with you when you move. You could take advantage of low fixed rates over a new, longer term for peace of mind. It may work out cheaper even if there is an Early Repayment Charge due. You will be tied in to your chosen rate for a period of time typically 2, 3 or 5 years and could be subject to an Early Repayment Charge if you repay the loan in this period. If you want to make large overpayments (typically more than 10% of the mortgage amount each year) within the fixed term you may be subject to an Early Repayment Charge. If there’s not long left on the deal when you port it, you may find rates have gone up further when you are looking for a new deal. If there is an Early Repayment Charge due, it could cost you more than porting.